The EU is confident it will reach its target of 20% renewable energy by 2020. But according to Martien Visser, this 20% is in reality more like 14%. This is because a large part of our energy consumption is simply ignored in the calculations for renewable energy. The EU has a target of 20% renewable energy in 2020. In 2014, 16% was reached and thus, it has been concluded that the EU is well on its way to achieve the target. After all, thousands of wind turbines are being built in our countryside and millions of solar panels are being installed on our rooftops. I assume that many readers are aware of the 16% level that we are supposed to have reached. But I wonder whether they have ever tried to find out how this percentage was calculated? I did – and it turned out to be far from straightforward. The official definition of the percentage of renewable energy is: “The share of energy from renewable sources shall be calculated as the gross final consumption of energy from renewable sources divided by the gross final consumption of energy from all energy sources, expressed as a percentage” (Directive 2009/28/EG, 23 april 2009). This sounds easy. Our total energy usage, the gross final consumption of energy can be calculated by taking the production of energy in EU28, adding the energy imports and subtracting the energy exports. Thanks to Eurostat, these data are public and it can be concluded that the EU-28 currently uses about 1600 Mtoe/yr (million tons of oil equivalent) to maintain its prosperity. Incidentally, this number neglects the energy which is required to create the products (e.g. in China) that are imported by the EU-28. However, as it turns out, this 1600 Mtoe is not the denominator in the directive since several areas of energy usage are excluded. Firstly, the conversion losses in the energy sector, like in power production, are not taken into account. One could argue that this is justified since a fully renewable world would not need fossil power production any more, although the increasing amounts of wind and solar power will also have conversion losses. Secondly, the usage of fuel oil for international shipping is not taken into account. Thirdly, energy consumption for feedstocks are excluded. The result: the “gross final consumption of energy” used to calculate the percentage of renewable energy equals only 1100 Mtoe. A denominator of 1100 Mtoe results in an almost 50% higher percentage of renewable energy than a denominator of 1600 Mtoe. This implies that a society with 100% renewable energy, according to this definition, would still require a substantial amount of fossil fuels. Let’s switch to the nominator of the equation. Here we also find some strange results. 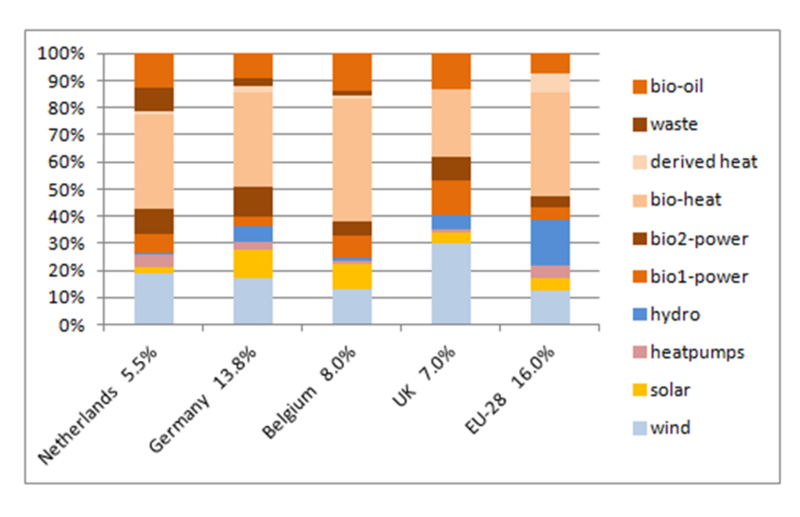 There are many forms of renewable energy and these are reported by the national statistical offices in the member states, and subsequently summarized by Eurostat. Although many people assume that renewable energy is based on wind turbines and solar panels, the reality is quite different. In the EU, more than 60% of all renewable energy comes from various forms of biomass. Another 17% comes from hydropower in the mountainous regions. A very important application of biomass in the EU is wood in households for wood stoves and open fire places. The efficiency of these applications may be 50% or even lower. Nevertheless, all wood is taken into account as renewable energy. In European countries with a lot of wood combustion in households, this significantly improves the national renewable percentage. Currently, the percentage of renewable energy in the EU is 16%, but taking into account an efficiency of 50% would lower the EU-28 renewable percentage to 14.2%. For other uses of biomass, efficiency is taken into account. The exception is biomass used as a feedstock; this is not taken into account at all. The lesson is that if we want to have a high percentage of renewable energy, we should burn biomass preferentially at home, and we should certainly not use it as feedstock. In other words: forget cascading biomass, burn it! Heat pumps get special treatment as well. I always thought that heat pumps are a way to reduce energy consumption. This may be true, but there is another aspect. While writing this article at home, the sun is shining through my window. The heating is off, although it is rather cold outside. But this solar energy does not count as renewable energy. My neighbour, however, has no window towards the sun and has to use a heat pump to bring the solar heat into his house. This solar heat is seen as renewable energy. According to the directive: “Thermal energy generated by passive energy systems, under which lower energy consumption is achieved passively through building design or from heat generated by energy from non-renewable sources, shall not be taken into account for the purposes of paragraph 1(b)”. Good lobbying by the heat pump industry, I presume. The statistics for renewable energy go into significant detail and nothing seems to be forgotten. One of the small categories is charcoal, which adds 128 ktoe to the EU-28 target. For environmental reasons, one may have some doubts about its sustainability. But the contribution to renewable energy nevertheless equals 250 3MW wind turbines of 100 meters each, positioned in a windy region in Northern Germany. A nice idea isn’t it, to think that you are contributing to the EU-28 targets on renewable energy when you will be having a barbecue and drinking beer with your friends this summer. In an earlier article I wrote in Dutch, I made similar calculations for my home country, the Netherlands. The Netherlands is densely populated, it does not have many forests and is flat. Thus, the Dutch are having major troubles to reach significant amounts of renewable energy. According to the official statistics, it achieved only 5.5% in 2014. And in 2015 and 2016, it won’t be much better. Dutch energy consumption, according to the Dutch Central Bureau of Statistics (CBS), is 4000 PJ (petajoule) . But, according to the directive just 2100 PJ needed to be taken into account to calculate its official percentage of renewable energy. The Netherlands produced 115 PJ of renewable energy: mainly biomass, waste and wind. Thus, while the definition by the EU directive resulted in an official percentage of 5.5%, in reality less than 3% of Dutch energy consumption is covered. In the coming years, the percentage of renewable energy will need to increase significantly, both in the Netherlands and in the EU. For 2030, the EU has a target of 27% renewable energy, an increase by 70% compared to the current percentage. If we want to achieve this by wind and solar only, it would imply an increase by more than 400% compared to today. In reality, maybe with the exception of hydropower, all sources will have to contribute. But in whatever way we will achieve the target, the real lesson of this exercise is that if we want to say goodbye to fossil energy, we have a long way to go. Because even in a 100% renewable society, as defined by the directive, we will still need lots of it. Martien Visser (b.m.visser@pl.hanze.nl) is professor Energy Transition and Grid Integration at Hanze University of Applied Sciences (Hanzehogeschool) Groningen. This article was first published on energypost.eu and is republished with permission. Next PostWhat does EU power market reform mean for Central and Eastern Europe power markets?